I headed out to the Forestdale Cemetery in Holyoke this afternoon to see if any owls are hanging around there this winter. The cemetery gates were already closed to vehicles when I arrived, so I parked on a nearby side street and planned to take a stroll around the grounds. I didn’t get very far. As I got out of my truck, I had a flyover from a peregrine falcon that was getting tossed around in the strong, cold wind. 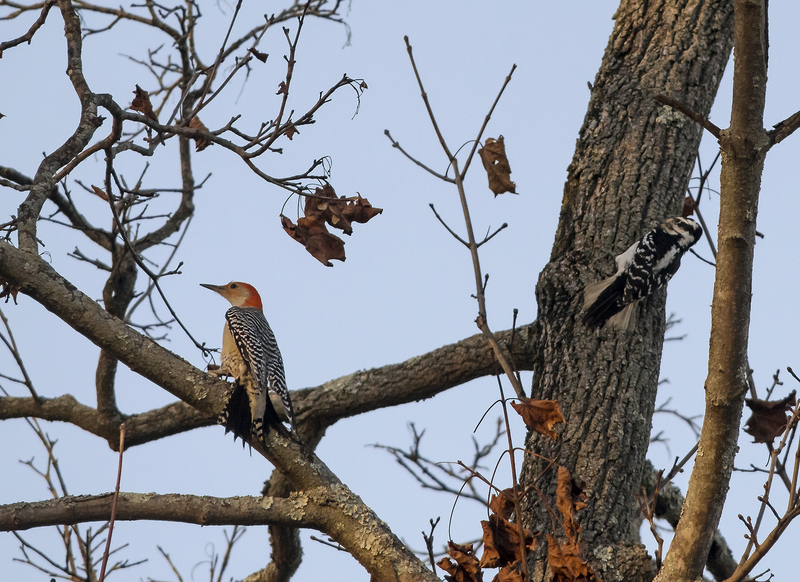 Then, out on Sycamore Street, I heard a commotion up in a dead tree — it was a hairy woodpecker tussling with a red-bellied woodpecker. The hairy woodpecker won the battle, with the red-bellied flying off into the cemetery. By that time the sun was on the horizon, and it was only going to get colder. So, a falcon and a few woodpeckers felt like a decent afternoon of birding. Greg: Your bird encounters never cease to amaze. If you saw a peregrine falcon, I wonder if it was a year-round resident? Fabulous photo of woodpeckers, too.